Friday 8/5 was quite a busy day. After I finished my courses etc. and once again I headed for home through the hell that has been renamed to “national road” at mid-day (all thanks to my fellow Greeks who crash their cars every now and then). 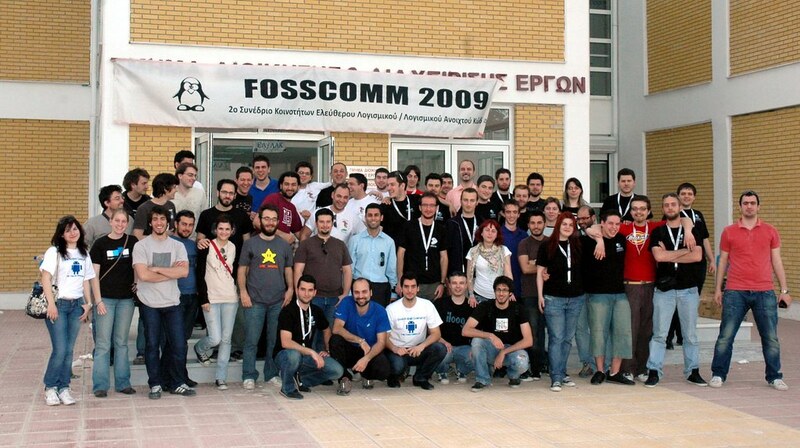 Anyhow, when I finally arrived home I picked up my Fedora and FEL (Fedora Electronic Lab) leaflets, my laptop and everything else I needed to go to FossComm 2009 along with Pierros and friends. Well, the trip was fine and we had a stop at Volos for a bit greek meze and a little bit of tsipouro. Afterwards we went to Larissa , got to the Hotel and relaxed in our rooms. I also met there my friend Alexandros. Anyways, Friday was not as interesting as Saturday. Next morning we were at the TEI of Larissa to prepare our booth for Fedora for the whole event (along with Christos Bacharakis, Thalia Papoutsaki and Pierros) ! We unpacked everything, from fliers to OLPC, plus I had my laptop to show some programs on FEL. All guys there did a great job organizing the event. The atmosphere was relaxing and also exciting. Now, let’s talk about Sunday 🙂 . Pierros Papadeas ‘s presentation on the Fedora project went really well! He really made clear of the goals, the people that support it, explained the four foundations etc…It was cool. Dimitris Glezos presented Transifex. For those who don’t already know, it’s an open source project, a localization web platform already used by the Fedora Project (Dimitris is a member of th Fedora Board!) and Red Hat, developed by Dimitris and the rest of Indifex ‘s (yeap, his company) engineers team. My presentation on FEL went quite good. It happened during our Fedora 11 Hackfest. I had to point out the goals of FEL, some interesting features that has and that will have (thanks Chitlesh!). I also presented some very interesting tools for design and simulation of circuits. I also mentioned the advantages of FEL, live every other Spin of Fedora has. It was my first presentation and the audience was not very into electronics (except to 2 out of 20-25 people). I had to try not to become boring, so I had to make changes instantly to what I previously prepared to say. Not the best feeling but at the end it was fun and I gained a great experience. On Monday the Fedora 11 Hackfest continued but I was absent due to a lab at my school I had to attend. Congratulations on your presentation. The first few times can be frightening, but it gets easier with practice. Take every opportunity you can get to practice, and soon you will be an expert. Back a million or so years ago, I presented my first really public paper to DECUS. This was a huge conference, attended by tens of thousands of people. I wasn’t too worried at first, though. My paper was titled “RSX/11 Crash Dump Analysis”. Back in the day, whenever a system crashed we used to paw through memory trying to figure out what happened. With such an esoteric topic, how many people would show? Maybe a dozen? Well, over 300 people showed up for my talk, but worse, in the front row were all the giants of the RSX world. And in that group, people weren’t nearly as supportive as they are in the open source world. Naturally, I was scared to death. Well, the talk went reasonably well, considering how nervous I was. But that paper became something that all RSX sysops kept in their desk drawer, even those experts. The moral? When you take the time to prepare a talk, you become the expert. Be confident. And practice! Thank you very much for the great job 🙂 Hope to meet you again soon.